Usually other online publications will offer you a week on the wrist article, where the author of the article is handed a watch by the manufacturer which they will test out over a week by walking around in the crisp and sunny city mornings or sitting in an Italian-inspired coffee shop. WristReview presents something a bit different for you today. 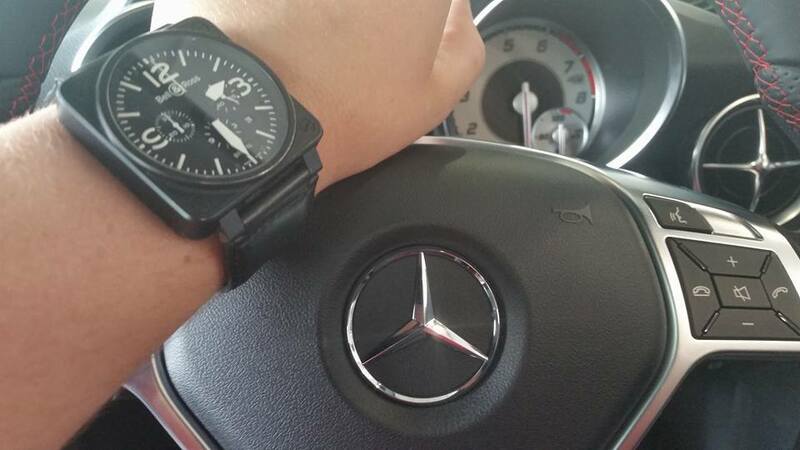 I’ve had double the amount of time to get to know this watch personally and wear it around a bit. The fist thing I can tell you about it is that it’s BIG, and I mean it’s really big. 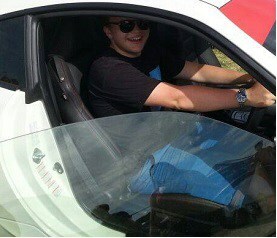 That might just be me, who until recently wore a 36mm Omega Seamaster every day. The round part of the watch face that holds the sapphire crystal in place is 46mm in diameter. Not to mention the fact that because this is part of their range that’s inspired by the instruments in aeroplanes, the squared case itself stretches out even further beyond the 46mm due to its rather large and rounded corners. 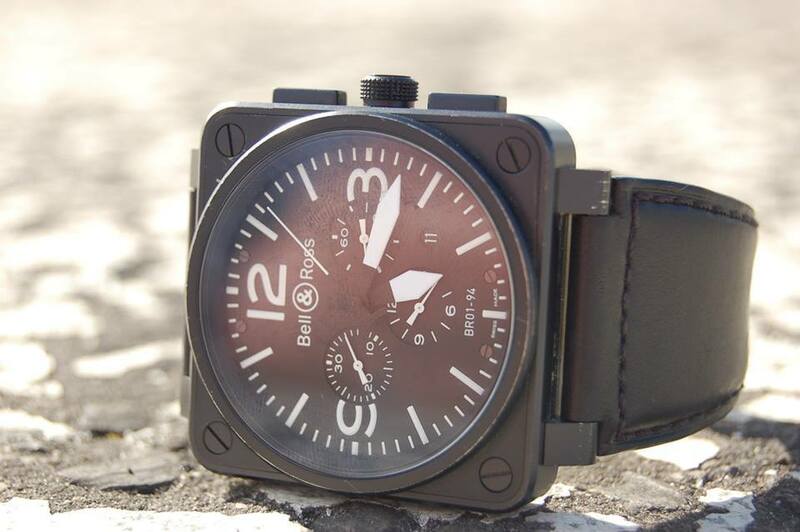 This could be a nice alternative for those who like the idea of a large watch, but they don’t want the height of them that you might find on a diving watch. I say this because despite its huge case dimensions the case itself is 9.98mm thin without the raised sapphire, and 12.54mm with it included. 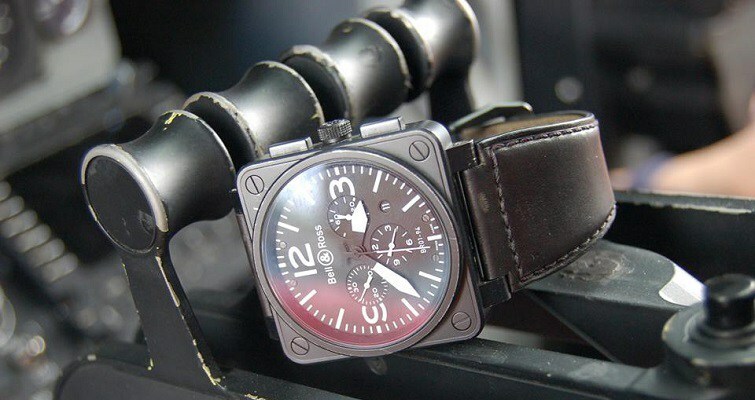 The case is made of stainless steel that’s been PVD coated black (with a corresponding buckle) giving a somewhat stealthy appearance to it, thanks to its dimensions the watch itself is quite heavy but feels really solid at the same time which balances out the mass. 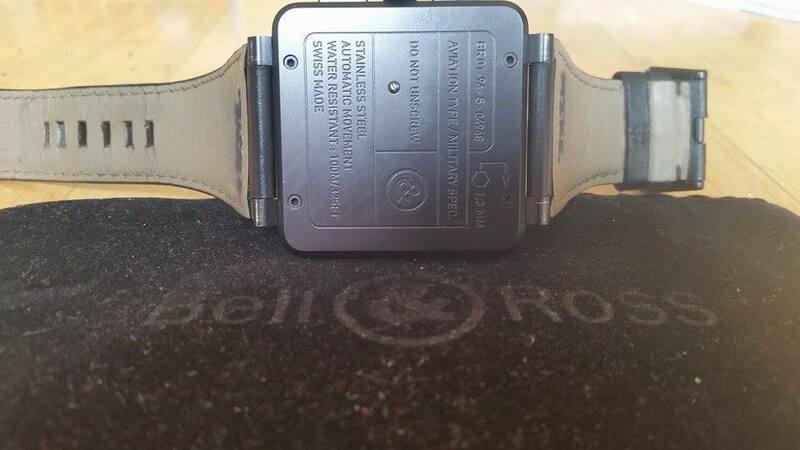 One thing you will notice about the watch when you look at the back is that there are no small gaps which show that there is a backplate to this watch like with pretty much every other watch out there bar the Reverso models. Because of this solid case back 4 huge screws on the front of the case seal the parts together into the case very well. To make sure that owners who love mechanical watches don’t do critical damage to their watch without realising it, the mounting screw on the back of the watch has been marked. The watch in the photos is presented on the Bell & Ross black leather strap which is made by hand and expands to suit the watch well when it’s worn. There’s also a rubber strap supplied with the watch and the tool to change them so you can take your personal choice out of the two. 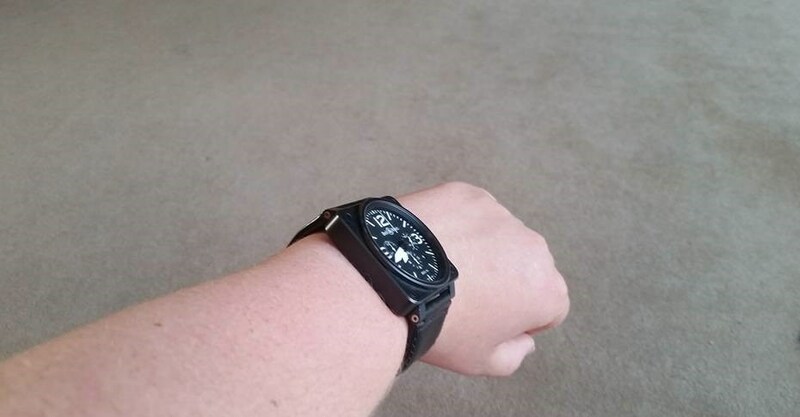 I personally don’t like leather or rubber straps on a watch as they get very uncomfortable for my wrist in warm weather, however, I found the strap to be quite pleasant despite the recent heatwave which hit Europe. 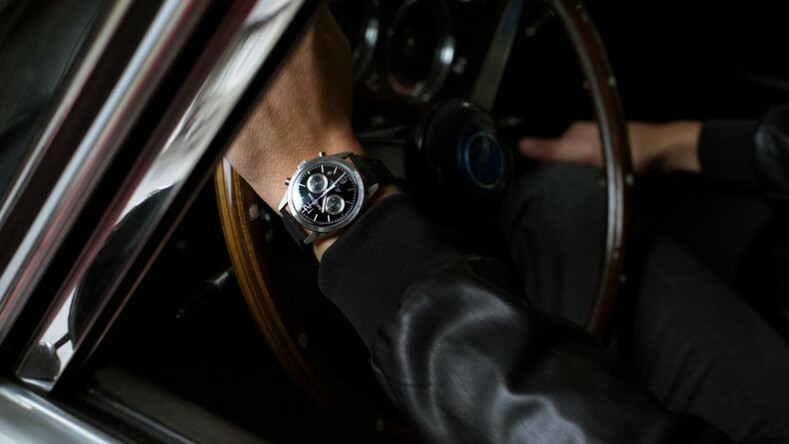 The chronograph on this watch makes use of subdials at 6 and 9 O’clock with the latter showing minutes. It runs well and the square pushers on the side of the case give a strong click with a little bit of resistance when depressed. I have noticed that the chronograph seconds hand does not return exactly to zero as on the dial when reset is pressed and the hand also jumps around by less than a second when the chronograph is stopped. I have yet to test this chronograph movement with another, however, it doesn’t particularly bother me. The movement in this watch, as with all Bell & Ross watches right now, is an off the shelf ETA chronograph calibre that’s installed in the case in the factory. Don’t let the movement in the watch put you off if you are thinking of buying one though, the parts are solid and reliable and the movement has proven itself many times in other watches over the years and helps to keep costs for the company down. 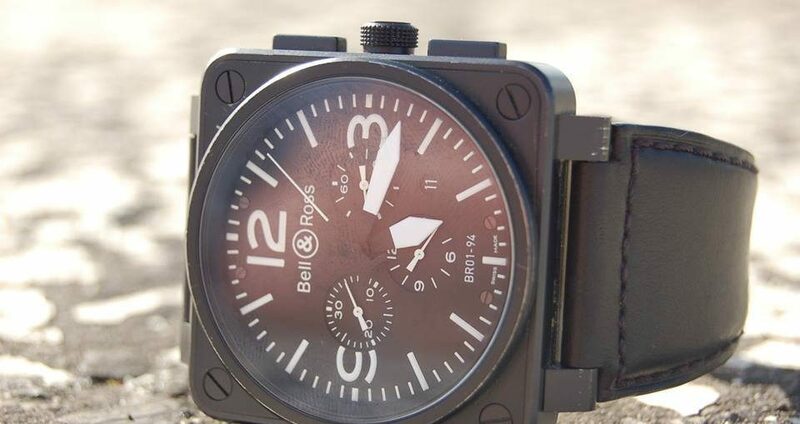 If Bell & Ross ever made the decision to go with their own movements the cost of purchasing and maintaining the watch would shoot up dramatically. The large, lume applied hands and indices on the dial make time keeping especially easy. The bright contrast of black on white here means that you really can just glance at it to tell the time and it’s the same with the small date window at half past four. 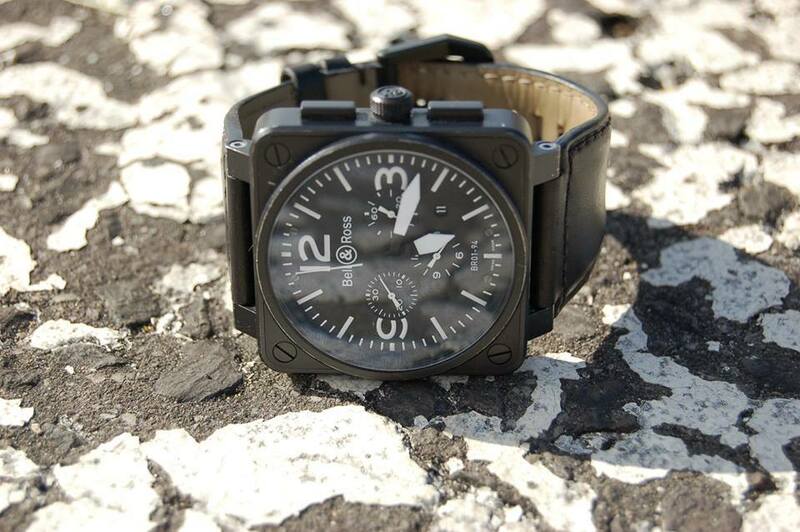 The crown on this watch is of the screw down type and the watch is water resistant to 100 meters. 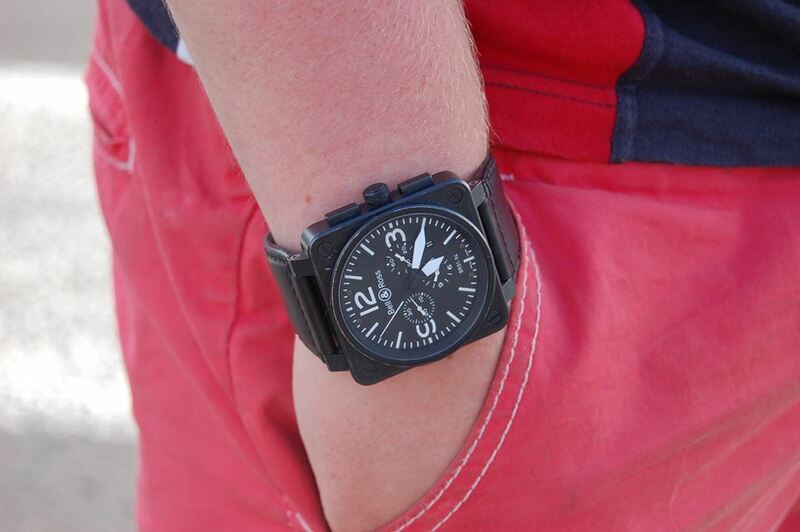 This isn’t a diving watch at all though, so you need to make sure not to operate the pushers under water. If you aren’t supremely careful with the watch then you may find that the bezel around the sapphire crystal will scratch pretty easily. 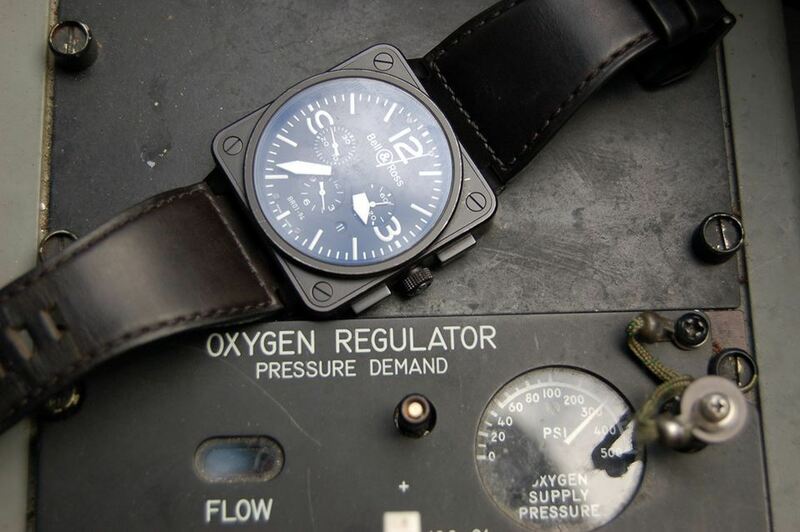 The case itself isn’t damaged, but as with all PVD coating, it is possible to scratch it off by accident leaving a slightly imperfect looking watch (however, most airplane cockpits have scratches here and there so you could argue it adds to the character and realism of the watch). Nevertheless, this is a fantastic and sturdy watch to wear around and it gets some compliments from those who are “in the know” about watches. You’ll also be pleased to know that Bell & Ross offers smaller versions of this watch too in case the 46mm was a bit large for some tastes. 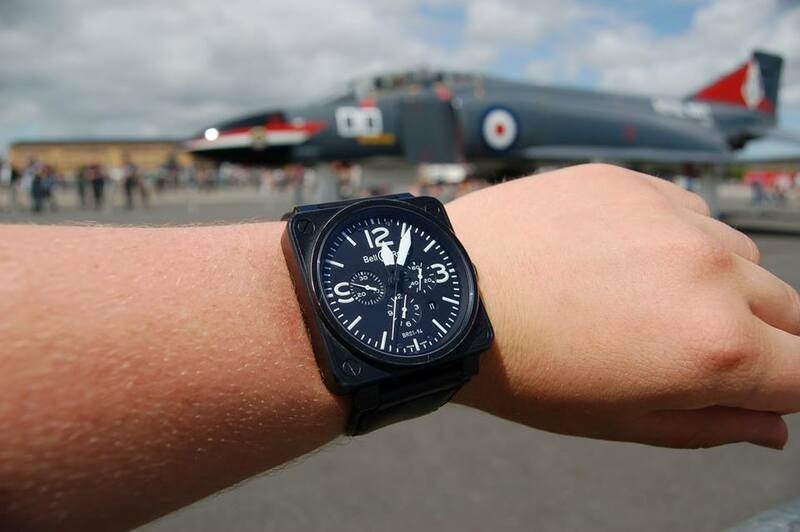 A big thank you goes to Mr M. Grove for allowing me to use his Bell & Ross watch for this article.